WASHINGTON - Employers pulled back sharply on hiring last month, a reminder that the U.S. economy may not be growing fast enough to sustain robust job growth. The unemployment rate dipped, but mostly because more Americans stopped looking for work. The Labor Department says the economy added 120,000 jobs in March, down from more than 200,000 in each of the previous three months. 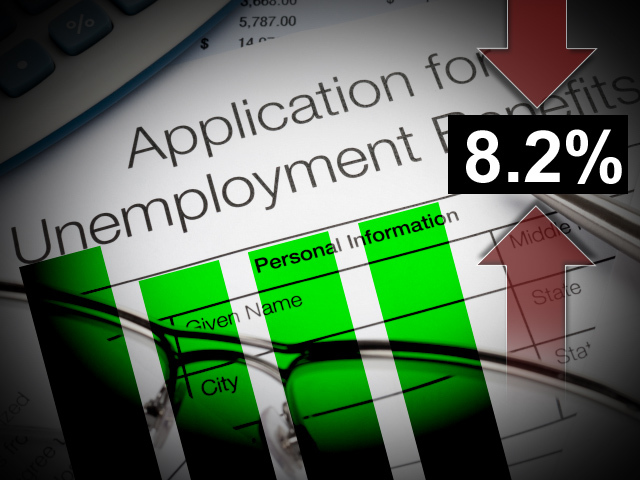 The unemployment rate fell to 8.2 percent, the lowest since January 2009. The rate dropped because fewer people searched for jobs. The official unemployment tally only includes those seeking work. The economy has added 858,000 jobs since December - the best four months of hiring in two years. The mixed report was a disappointment after three months of solid job growth. The slowdown in job creation could threaten a recent rise in consumer confidence and dent investors' enthusiasm for stocks. It also could prove a setback for President Barack Obama's re-election hopes. Treasury yields and stock futures dropped sharply after the report came out. The yield on the benchmark 10-year Treasury note fell to 2.09 percent from 2.20 percent, while Standard & Poor's 500 index futures fell 0.8 percent to 1,381. Both were little changed in the minutes before the report was released. Most U.S. financial markets are closed for the Good Friday holiday, and others are open for abbreviated sessions. The stock market is closed, but index futures are trading until 9:15 a.m. Eastern. U.S. government bond trading ends at noon. Federal Reserve Chairman Ben Bernanke has cautioned that the current hiring pace is unlikely to continue without more consumer spending. Retailers shed nearly 34,000 jobs in March, and temporary help firms dropped almost 8,000  a potentially bad sign for the job market because companies often hire temp workers before adding full timers. Manufacturers continued to add jobs, hiring 37,000 workers in March. A broader measure of weakness in the labor market - which adds to the officially unemployed those who have given up looking for work and those forced to settle for part-time jobs - improved last month to 14.5 percent from 14.9 percent in February. The Bureau of Labor Statistics said the economy added 4,000 more jobs in January and February than it previously reported. This year's election is expected to hinge on the state of the economy; Obama's re-election hopes may depend on continued improvement in the unemployment rate and job creation. Former Massachusetts Gov. Mitt Romney, the likely Republican challenger, this week blamed the president's policies for slow growth and high unemployment. The Obama campaign has said that Romney would reinstate policies that led to the recession - lower taxes for the wealthy and less regulation for business. For many, what matters most is the unemployment rate. It was 7.8 percent when Obama entered office in January 2009 and peaked at 10 percent nine months later. Since August, it has dropped from 9.1 percent to March's 8.2 percent. No incumbent since World War II has faced voters with unemployment higher than 7.8 percent. Other data suggest the economic recovery is gaining strength. The number of Americans seeking unemployment benefits fell last week to a four-year low, the government said Thursday. Consumers are more confident and spending more. The service sector expanded at a healthy clip in March and increased hiring, according to a private survey released Wednesday by the Institute for Supply Management. Factories are busier. Companies are investing more, ordering more machinery and other equipment. Economists have worried all along that job growth couldn't sustain the strong December-to-February pace. They also worry that a 66-cent run-up in gasoline prices (to a national average $3.94 a gallon) so far this year will discourage consumer spending - though American households are more resilient financially after cutting their debts. Most economists expect annual growth this year of just 2.5 percent. Normally, it takes annual growth of 4 percent to lower the unemployment rate 1 percentage point over a year. The job market is improving largely because the pace of layoffs has fallen sharply. The staffing firm Challenger, Gray & Christmas reported Thursday that planned layoffs fell 27 percent from February to March. Hiring, meanwhile, is still running nearly 20 percent below pre-recession levels.